Managers – Want to Protect Your Equipment and the Environment? Many locations have restrictions on how much residual grease can be left in used steel kegs and drums when these are being sent for disposal. This has been a pain and VSG grease has characteristics that are good in bearings but which can make cleaning the containers more difficult. At the request of users all VSG steel kegs and drums now have a disposable flexible plastic liner. This is made of LDPE which can be recycled where allowed. The use of a flexible liner makes it much easier to get out the last bit of grease and to add it to the new container as well as to be able to quickly clean out the containers for reuse, recycling or disposal. As a caution to reduce the chances of the liner being pulled down by the follower plate used with grease pumps, it is suggested that the loose end of the liner at the top be taped to the container. If you have any question, please call or e-mail. To order MOV Long Life or MOV Extra contact one of the following; Canoil Canada Ltd. at 905-820-2022 or Toll Free 1-855-520-2022, CI Actuation, Georgia Western at 770 426-6070 or toll free 800 536-6070, Fax 770 426-6191 or Pinnacle Actuation toll free at 800-829-8145 and Fax 770 926-1637. It can be available from others as well. Food Grade, NSF and Bio greases are also available. 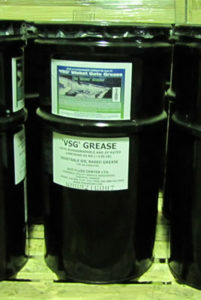 To order VSG ‘The Green Grease’ contact Eco Fluid Center at info@fluidcenter.com, 416 466-3144 or toll free 888 442-5008. 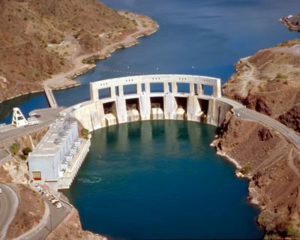 US Bureau of Reclamation Bulletin December 1998 – please see page 13. 1. What’s special about VSG grease? First it is mainly canola oil which is a natural renewable resource. 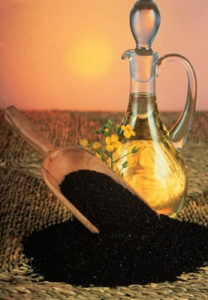 Canola oils are also low in toxicity with many being food grade for cooking oils and they also tend to be readily biodegradable. Secondly, the grease thickener used is relatively benign and has both inherent corrosion protecting capabilities and extreme pressure resistance. Thirdly, the combination of these two offer a grease that is ‘green’ and yet outperforms many mineral oil based products. Some users have found that much less if required so that this is an added benefit. VSG generally provides much better corrosion protection and wear resistance while at the same time being more resistant to grease line plugging. VSG has excellent pumpability at low temperatures and yet also stiffens up in contact with water so it gets to the bearings and stays there better. VSG has been independently tested by a number of utilities and by outside organisations. This data is available in most cases and there are links on the website to Bureau testing. The calcium sulphonate thickener is compatible with many of the lithium and calcium greases being used for wicket gates. Data is available for the other types and at the worst an intermediate grease has to be used for a short period of time. But this has not been necessary yet. We do not recommend purging the lines. The components of VSG are more expensive and it is still a specialty product with low volumes. However, as it becomes more popular some costs will come down. In any case the amount of grease being used for a unit is seldom more that a drum per year so the incremental cost should be less than $1,000. Given the performance benefits and the high costs when dealing with regulators, cottage owners and the like it can be well worth it. One station ended up using 42 times less grease so they saved big time.